Though Alphonso Labs only had Android and iOS apps available when we published a review of Pulse News Reader earlier this year, the company finally rolled out a Windows Phone app earlier this week. Though there are slight variations between each platform, the overall concept remains the same. When a user opens the app, Pulse presents news feeds in a grid-like layout with a tile for each story. It appears as though the Pulse app may even take advantage of the new live tile APIs provided by the latest Windows Phone Mango release by offering bits of information on the home screen — an exclusive for this platform. Users can still view either the text from a feed or load the webpage containing a specific article from within the app. 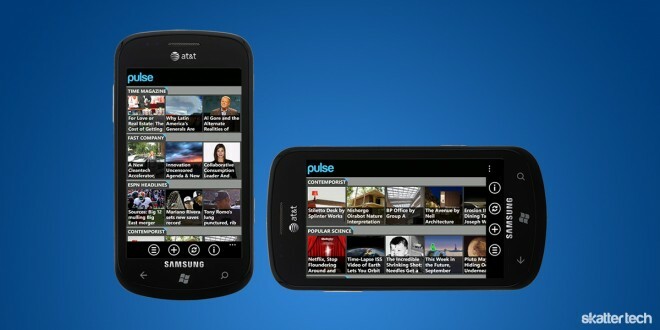 Pulse also allows sharing stories with friends by Email, Facebook, or Twitter. Those looking to add Skatter Tech to Pulse can do so quite easily by searching for “skatter tech.” It is unclear whether there is integration with the Pulse.me service announced earlier this year. I am also curious to see whether Alphonso Labs intends to roll out a Windows 8 Metro app, which would be an appropriate complement. 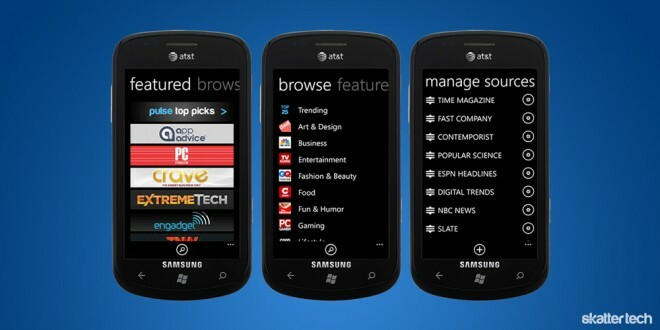 In the meantime, you can grab the Pulse from the Windows Phone Marketplace. For those wondering, the company raised $9 in Series A from NEA, Greycroft Partners and Lerer Ventures in June 2011.